Healthcare is all about “critical thinking,” which occasionally prevents us from getting stuff done and actually healing patients. Click the picture to take our new course about communication and acting on properly processed information. That’s a major challenge at any workplace: removing the distorted lens of perception and seeing things as they are. Is the boss terrible, or does corporate culture just place that mantle of ineptitude on everyone in leadership? Are coworkers clear and brutally honest, or are you being bullied? And finally, do I really use phrases like “mantle of ineptitude” when internally asking myself questions? Yes. Our last post discussed the importance of outside perspectives, but let me illustrate with a story how to achieve a more holistic viewpoint. I (Nick) rent out my house as part of the snowbird process. The final step will be driving 20 miles under the speed limit wherever I go. It’s surprisingly difficult to clean your house for others, because I’m used to my own mess. I mopped the floors and polished the furniture, but almost missed coffee stains on the kitchen cabinets. They’ve probably been there a while, but long ago my brain told my eyes, “There’s nothing to see here. Let’s concentrate on other things.” Take a step back and will your mind to see things for the first time. It may be an emotional undercurrent at the office, or an automatic response to a seemingly neutral stimulus, or even the way coworkers treat certain employees without apparent cause. Notice normal reactions and those that seem out of place. Culture is extremely powerful, especially during times of conflict, stress, and grief. I read a story today of a funeral home simultaneously hosting calling hours for an American–stoic, somber, whispers of dull platitudes such as “God needed an angel” and a Filipino–kids climbing around the casket, people talking loudly, etc. We revert to traditional ways of doing things, and it’s helpful to ask the simple question, “Why?” Why is the best for the patient, client or customer, and why do we think this way is the best way? None of us could work effectively turning over every stone inquisitively, but pick your battles and see what you uncover. Our new course isn’t the only project we’ve been working on. 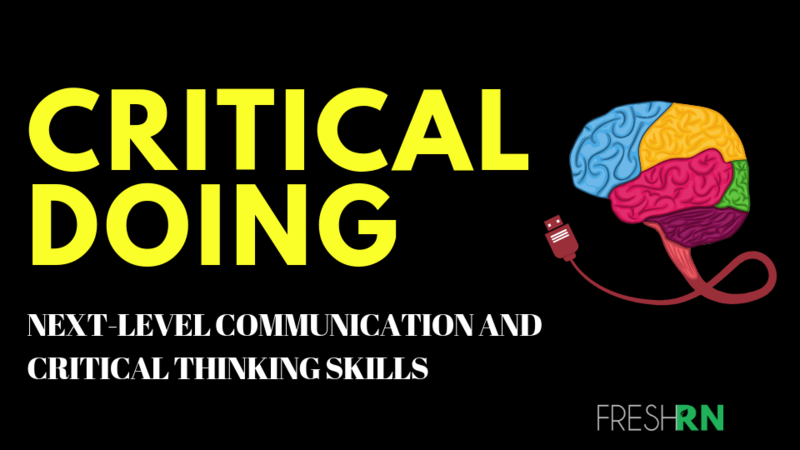 “Critical Doing” is certainly entertaining, especially the interactive videos filmed underwater in Greece and Florida (very relevant to the nursing process), during hurricanes, and while wandering around forests and crowded malls. We are starting a pain and mental health clinic in Akron, Ohio. We have about a dozen employees, and it’s past time to stop talking about corporate wellness and see if we can actual materialize our idealistic views. By putting employees first, we hope their joy will be contagious and lead to much better patient outcomes than the current cookie-cutter methods of care. We’ll continue to update you all on our progress, triumphs, and failures as we do our part to change the broken healthcare system and practice critical doing.